Here’s my first review for my BeautyMNL loot. The MeNow Kiss Proof Soft Lipstick is in a jumbo lipstick form. The stick itself is matte in finish, like a crayola wrapper, only shimmery. It comes with a cap. I got it for Php 149 a pop. Yep. 1-4-9. Like, if you give 150 bucks, you’re going to receive a piso as change. Wow. I mean, right?! It’s not a retractable kind, so you better have your sharpener ready. 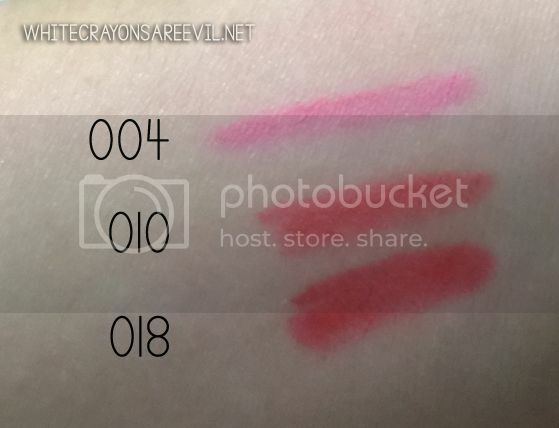 I got three colors, and I have to review them separately because… well, you’ll find out. No. 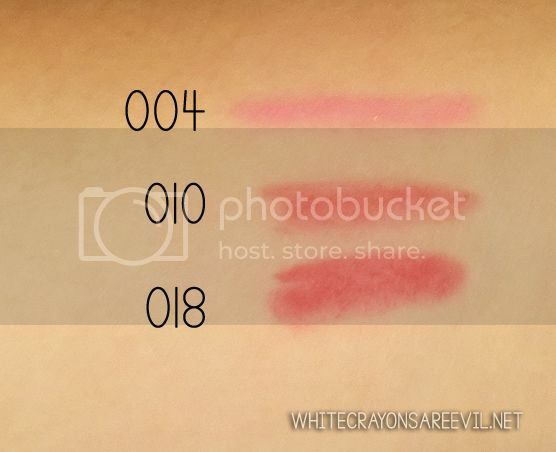 004 has a gorgeous light pink shade, which I thought I can wear during the summer for the fresh, youthful glow. However, I was GREATLY disappointed with this one. This doesn’t look solid when applied. it has the uneveness texture of a crayons. White crayons are evil, BTW. It also finished in a very dry texture. Like a dried mud. I hate this so very much. This is probably my first “Thing I regret Buying” in my history of beauty blogging (which is nine days). the worst part is I bought two because the color’s so gorgeous and I wanted to give one as a gift, but I won’t do that anymore to save myself from embarrassment. What I did was I applied a thin layer of lip gloss before wearing this, and another layer after. It did improve the texture a thousand folds, but not enough to make me want to wear this outside the four corners of my room. I tried using the pencil as… err… cheek pencil (?! ), and I liked it. I probably won’t do it everyday, but at least I’ll have something to use this pencil as. The color’s red but in the lighter, less deeper side. There’s going to be a very awkward feeling after putting it. Sometimes sticky, sometimes powdery. Just let it dry for a minute or so. The texture of No. 010 is 5000000x better than that of No. 004. Application was easy because it glides on my lips. It left a creamy feeling immediately but dries to a matte finish. But unlike No. 004’s matte, 010’s matte is totally, very much acceptable and wearable. 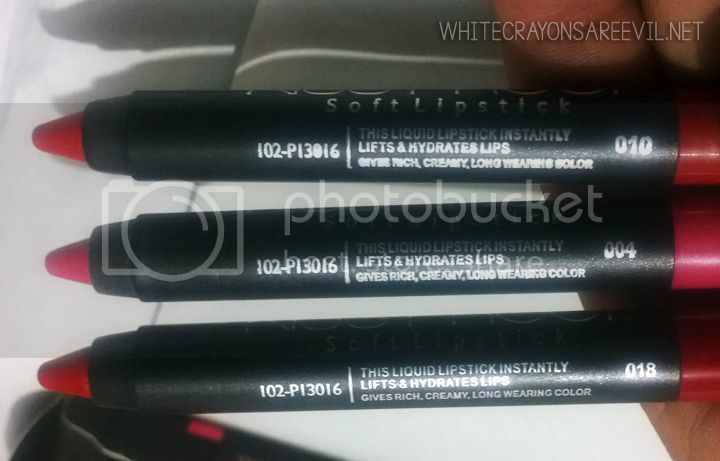 The matte-ness is also not as intense and a tad bit more moisturized than that of Pink Sugar’s Sugar Tint’s. After about some moment, I can feel a powdery texture, like there are some micro sands in my lips. Bothers me a little. Staying power was pretty ok for its price range. I was quite disappointed though since an arm swatch was really, REALLY difficult to clean, yet the staying power of the lippies only go as much as maybe five hours? It can live through decent amount of water drinking and food eating, but it would not last the whole day. There are still colors after lunch, however, the inner rim of the lips are already colorless. Hence the need for a touch up. the formula and texture of No. 018 ‘s the same as No. 010. THANK GOD! this is also a gorgeous red, but deeper than No. 010. It’s less coral and more ruby. I LOVE IT! They have TONS of colors to choose from. You can check out some Youtube reviews for swatches (DYNA swatched all the shades, so her two-part videos were very helpful). I like how comfy to the hands the size of the pencil is. 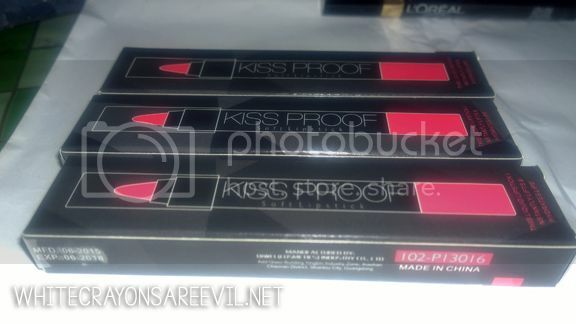 I also saw MeNow Kissproof Lip Pencil at Shopitude in Espana, Manila. However the colors are super limited, maybe two or three. Are those authenticate ones? I mean the price is 149php? Really?